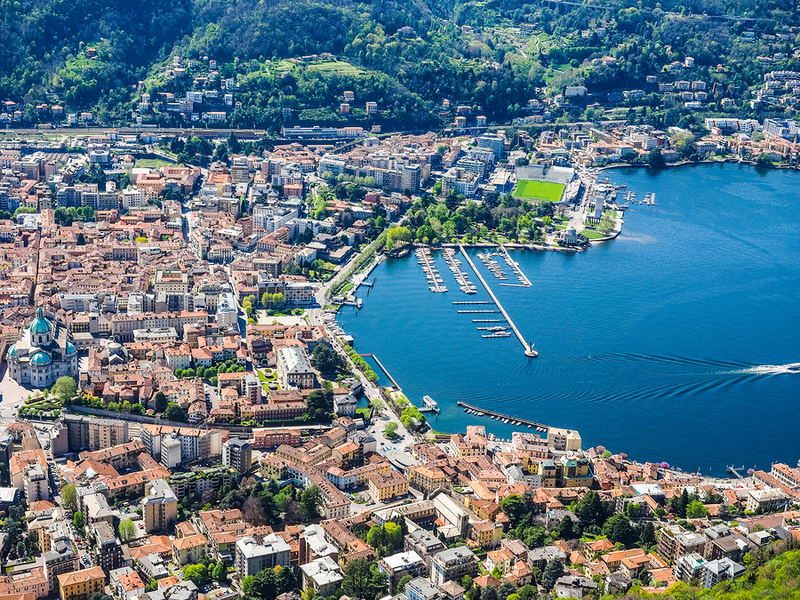 Lake Como has been attracting visitors for thousands of years but many completely overlook the serene City of Como on the South Western tip. Only one hour from Milan and 40 minutes drive from Malpensa Airport if you are looking for a town with lots to do but without feeling rushed this is the perfect destination. Como is a wonderful place to explore as a visitor but also has great prestige with its own countrymen and women. It’s a wealthy Northern Italian city with the typical hard-working mentality you find in Lombardy. The city as we know it now with its large white stone buildings settled into the center of the surrounding hills was first created by the Romans around 1st Century BC. It now looks perfectly nestled into this position but the first settlement of Como actually began on top of the hills around it. We will start with the top of these hills and the little village of Brunate. Accessible by cable car or ‘Funicolare’, the journey to the top is just 7 minutes. When you arrive you have an impressive view of the lake, and some small stalls and restaurants to refresh you. However, follow the signs to the ‘vista panoramica’ and you will find a path leading you to a small terrace with even more fantastic views of the City of Como and the lake beneath you. If you do enjoy walking, there is also a short 30-minute trail up to the Volta Lighthouse. When it’s open you can climb to the top and see views of Como and the Alps. It was built and named after Alessandro Volta who will we come to next! Alessandro Volta was a physicist born in Como. He was the inventor of the electric battery and the discoverer of methane. As one of Como’s most famous citizens, there are numerous references to him around the City. One of the most exceptional is the Volta Temple and Museum. The bold exterior is worth a view even if you don’t have time to take a look inside. There you’ll find a collection of his scientific instruments on display, along with personal belongings and his awards. 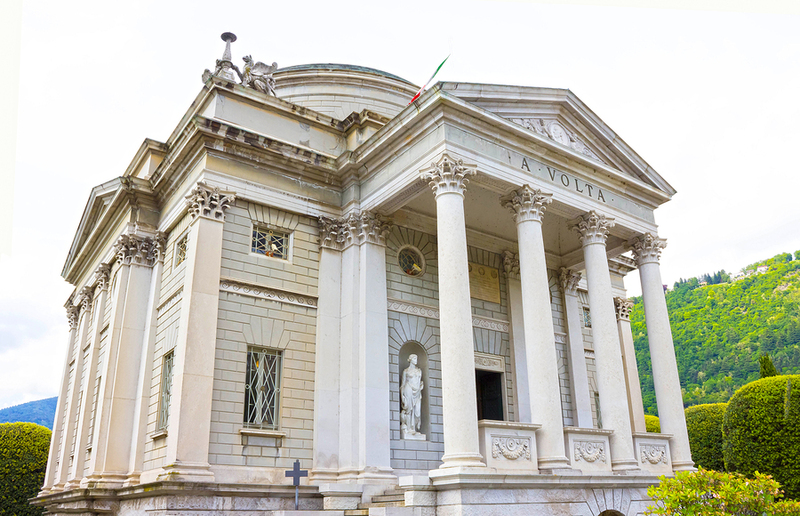 In neoclassical style and situated on the lakeside in a splendid position, this is one of the most visited attractions in Como. The stunning cathedral of Como or Santa Maria Assunta is built in the shape of a cross. It’s a wonderful example of late Gothic architecture. As different styles became popular over the years, some Renaissance modifications have been made to the original construction. The Duomo has a beautiful pale green dome and is striking against the white of the surrounding stone buildings. An unusual building next to the Cathedral. Casa del Fascio was the local branch of the National Fascist Party under the regime of Benito Mussolini. It is sometimes called Palazzo Terragni after the Italian architect who created it, Giuseppe Terragni. 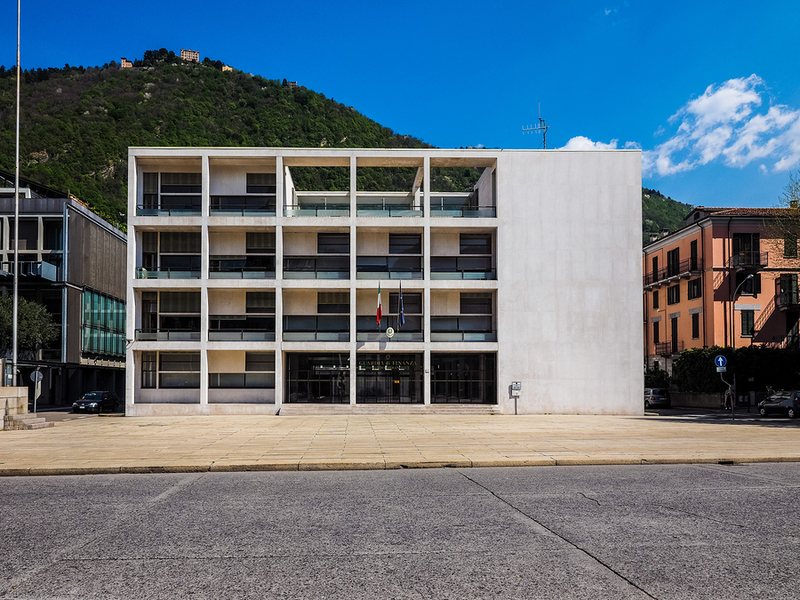 It has a chain of glass internal doors, built so that with the switch of an electric control the building could open onto the piazza for fascist rallies. Not your usual visitor attraction but a fascinating modern building (both in the 1930s and now) representing a darker part of Italy’s history. The building now houses the Guardia di Finanza. A branch of the Police force under the authority of the Minister of Economy and Finance. It is sometimes open to the public, though dates and times are not publicized and entrance is free. Seta meaning Silk in Italian. Silk has been part of Como’s history for hundreds of years. In 1400s mulberry trees were planted in abundance around the lake and being the ideal food for Silkworms, production of this delicate material began to boom. Even with lower production costs in China many exclusive designer retailers still prefer to use Como silk. To take a look at the whole process from worm to garment! Visit the Museo della Seta. You can see materials, machines, and find a little something to take home with you, hopefully, a scarf not a worm! 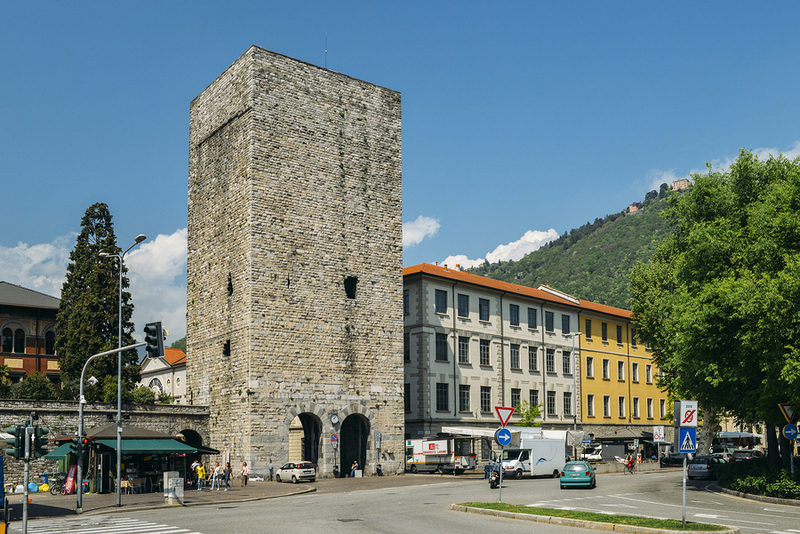 Though you can still see remnants of Como’s medieval walls around the city, one of the most striking monuments from this period is the Porta Torre. Meaning ‘Tower gate’ this imposing structure was situated at the entrance to the city and symbolized independence from Milan. Here you have a splendid view of the original medieval walls and three remaining towers of the City. There is also a statue in honor of Giuseppe Garibaldi, the Italian General who liberated Como from the Austrians in 1859 but most significantly took part in the unification of Italy in 1861. If all that exploring is making you hungry Piazza Cavour and the more hidden streets around Piazza San Fedele are perfect spots to find quality cafes and restaurants. Delicious dishes here combine the influence of both the lake and surrounding mountains. You’ll find the popular lake fish missoltini. Lombardy favorites such as Ossobucco, polenta both yellow and buckwheat. Chestnuts incorporated into classic desserts such as Tiramisu and a wonderful selection of cheeses. 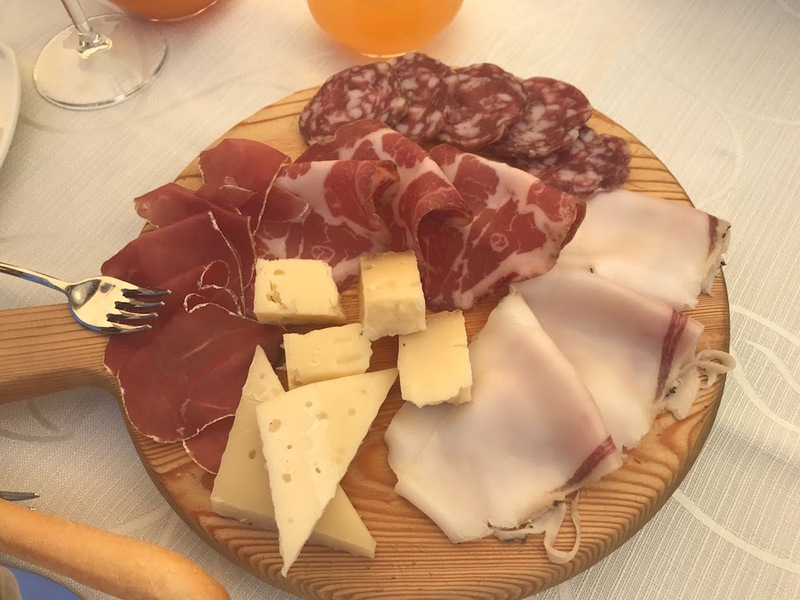 Try Zincarlin and Semuda, made in small quantities on the Western shore these local cheeses have distinctive flavors and are barely known outside of their Italian province. The historic center of Como has a great selection of shops from high-end designer labels to more reasonably priced brands. Piazza San Fedele holds an antique market the first Saturday of each month although there are often extra craft markets and events taking place most weekends. It also has a beautiful church to visit at the same time, the Basilica of San Fedele. Of course, you can’t miss the opportunity to get close to the lake while you’re here. There is a long promenade, easily found from Piazza Cavour. You can if you wish to, book a private boat tour. This can be done by the pier at the Piazza Cavour. There is also the option to hop on one of the ferry services which take you to the most attractive villages along the shore. As you can see there is a vast amount to see and do in Como and all at a pace that suits you. I hope you enjoy the experience of learning more about this special City and its fascinating history.